Often I feel the need of amping up the whole makeup look whenever I try to wear the color/circle lenses with more dramatic designs. I usually balance them with darker smokey eyes or even with false eye lashes, but I thought liquid eye liner could be another option. 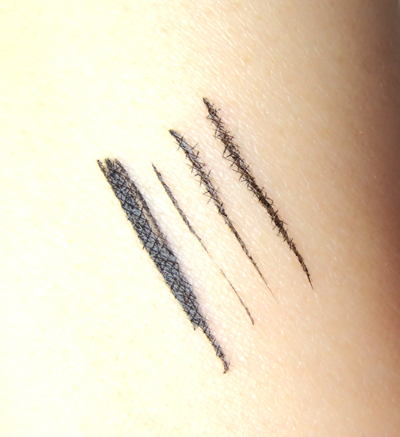 I did not want to spend much on something I would not use everyday so I decided to try a drugstore liquid eyeliner with good reputation. This liner is belted with a soft matte material that provides easier grip. The fine felt tip is firm yet flexible. 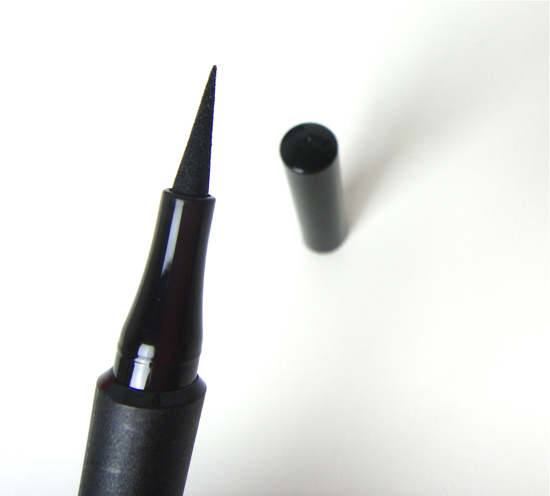 It is quite easy to draw lines even for someone like me, a liquid liner newbie. I have tried other felt-tip liners with similar shape (from Almay and Revlon), but they are too firm and inflexible to maneuver easily. 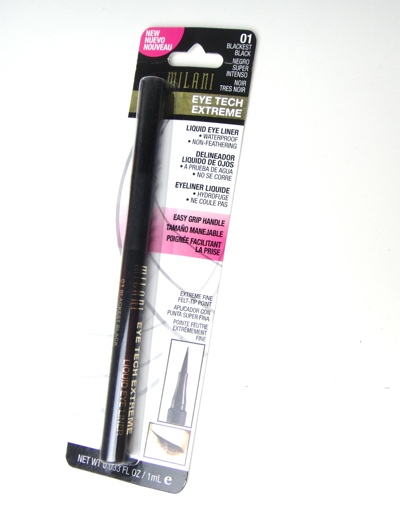 Milani liner has the perfect balance of firm and flexible, which I think is the greatest merit of the product. I tried it on my arm for both fine and thicker lines. It goes on quite smoothly with minimal skipping. I was concerned to see some feathering, but luckily I did not experience that on my eye lids. The name "Blackest Black" might be slightly misleading, though. It is not brown nor grey, but more of a matte black. 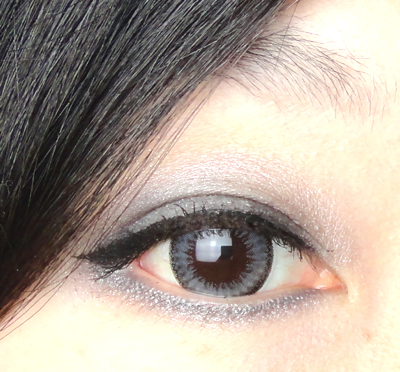 I tried thicker lines to create cat eye look pairing with rather enlarging color contacts (Hana SPC Natural Grey). These defined lines work perfectly well with the contacts that would easily make me look like a puppy otherwise. I am also satisfied that I did not have to use eye shadows heavily. 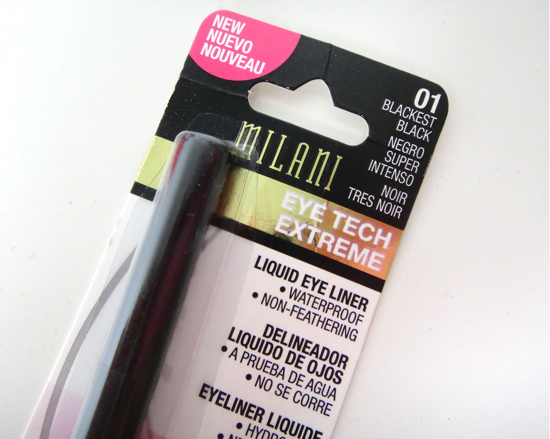 Milani Eye Tech Extreme does not smudge (even after a few hours of nap) and virtually stays all day on me. It can be removed easily with cleansing oil or bi-phased eye makeup remover. I did not experience any staining, either. 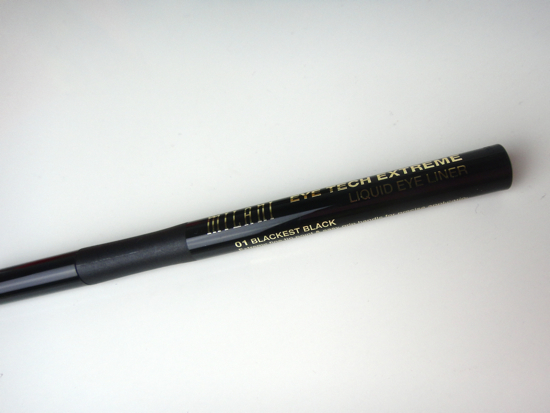 It would be difficult for me to give comparison in depth since I only have used a handful of liquid liners, but Milani Eye Tech Extreme satisfies all my liquid lining needs. Affordability (I paid less than $8 for this) is a great plus as well.